Big points to anyone who can identify this vegetable. What? You still can’t guess? Well, you are in good company. Two weeks ago, my friend Lisa and I met at the town farm to pick up our weekly CSA produce share, and this furry mess of green stalks was sticking out of the top of our boxes. Lisa, who knows more about veggies than anyone I know, was momentarily stumped. I was completely clueless. 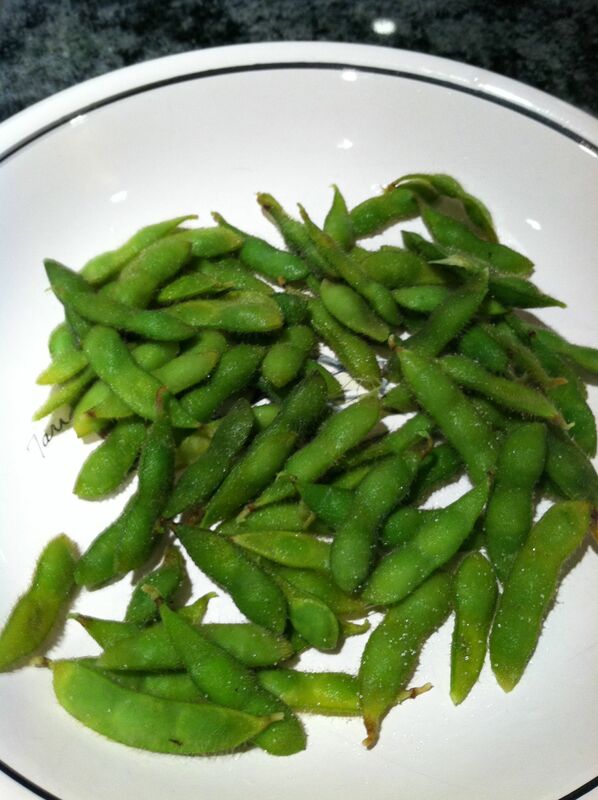 Turns out, these are edamame (eh-dah-MAH-meh), or fresh soybeans. Lisa figured it out by plucking one of the green fuzzy pods from the stalk, opening it up and nibbling. Who knew that fabulous appetizer of hot, salted pods I always order at sushi restaurants grew on massive, messy stalks? And that soybeans grow in Connecticut? Certainly not me. 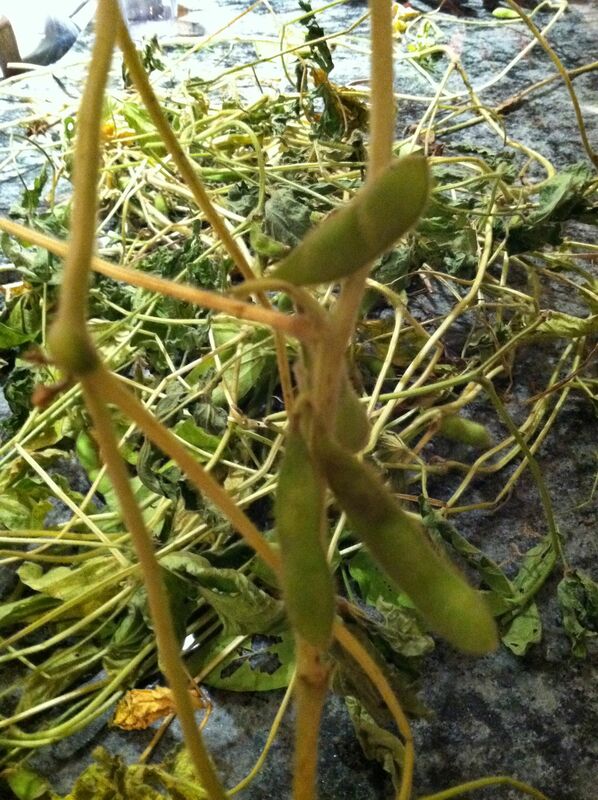 And apparently not many others either, as the ‘leave-a-veggie / take-a-veggie’ bin was overflowing with soybean stalks. Here’s a close-up pic (thank you iPhone) so you can see the beans hidden in the branches. Having absolutely no idea how to turn this mess of furry stalks into the delicious and nutritious edamame I love to order, I put the pile on the kitchen counter and started googling. Meanwhile my husband, unbeknownst to me, did not await direction (are there any men who ask for directions? Ever?) 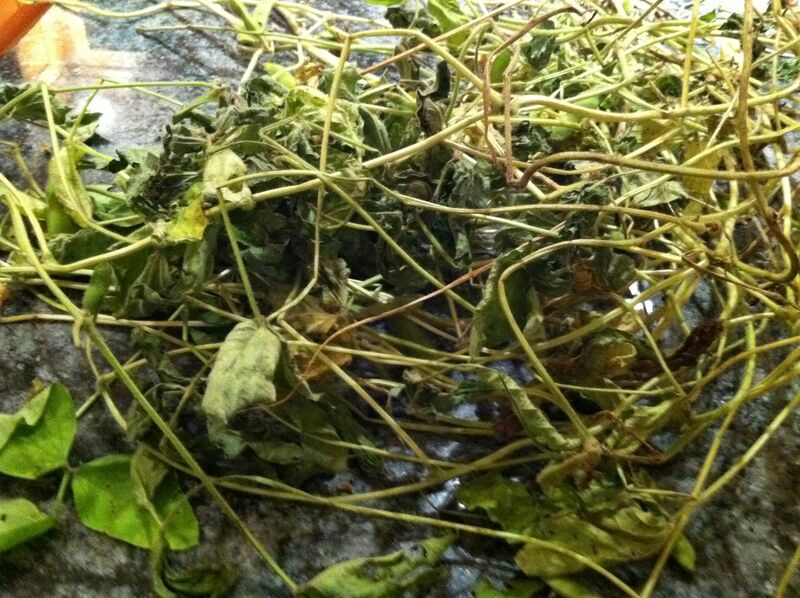 but simply stripped the pods off the stalks, piled them on the counter, then left. Thank you, Michael! Plucking the pods from the stalks is the only hard part of this recipe (and you will probably not have to bother, as you’ll be using frozen soybean pods…because, hey, what are the odds a bunch of fresh soybean stalks has landed in your kitchen?) Once you have pods, it’s just minutes to a delicious, healthy lo-co treat. The recipe I chose (end result pictured here) was penned by Mary Sue Milliken and Susan Feniger, both recently on Top Chef Masters, and it’s online at the Food Network site: Edamame: Cooked Fresh Soybeans. What I love about this recipe is these are two seriously accomplished chefs so the end result is great, they’ve made it clear and easy what you should do – and not do, and the recipe calls for either fresh soybean stalks OR FROZEN! Either way – using furry stalks or frozen pods – give this recipe a go. You’ll be rewarded with a delicious, nutritious, lo-co treat. This entry was posted in daily, recipes and tagged Cooking Light, edamame, Lo-Co, low cholesterol, Mary Sue Milliken, soybean, Susan Feniger, Top Chef Masters by KLS. Bookmark the permalink. Interesting! I had no idea that soybeans grew on stalks or in Connecticut! I love making a dish with edamame called Bagalah Polo (it’s Persian). two or three times until the top layer, which is a mound of rice, drizzled with curry and a tiny bit of melted butter. The traditional Persian dish can include lamb, but I make it vegetarian and my family loves it. The bottom layer of rice gets crunchy and makes it especially delicious. Hey I grew these last year in our community garden plot — they were a little freaky looking, but delicious! We also buy them from Trader Joe’s frozen (we get the ones already cooked and steam in the microwave). My daughter who does not make good snack choices will eat these every afternoon! Thanks for the recipe — will try tonite.